Deck Building, Designs, Restoration, Refinishing and Repair in New Jersey. Welcome to Decks by Ziec. Decks by Ziec brings stunning European craftsmanship to America, serving West Windsor, Chatham, Colonia New Jersey and surrounding areas, including New York. Owner Peter Ziec has been in the business of deck building for 17 years, possessing extensive training and experience. His passion and pursuit of higher standards in deck construction and design pushed him to start his own business. 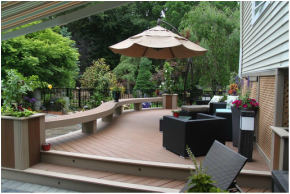 He is now recognized as one of the best deck contractors New Jersey has to offer. He can add value to your home while creating an outdoor space that is truly special and unique. Are you interested in a new patio? Have you been eyeing deck designs or looking for top quality deck restoration? Decks by Ziec can create custom decks for any area or do a deck repair on an existing structure, transforming it into something completely new. Don’t trust your deck construction to an inexperienced or irresponsible contractor. Peter is an expert craftsman, a savvy contractor, always professional and thorough on every project. He goes the extra mile, takes the extra time, and does the extra work to ensure every deck design or repair is the absolute best. His team reflects his own standards, only hiring the best deck builders New Jersey offers. Dedicated to excellence and elegance, Decks by Ziec can create deck designs for any client and won’t settle for anything but your complete satisfaction. Recently Peter, his brother Andrew and their team from "Decks by Ziec" designed and completed our deck for the backyard. Right from the beginning, Peter understood our needs and came up with an interesting and innovative design. From thereon, he and the team have been very responsive, attentive and prompt in their services. The team completed the work as scheduled, while being very flexible with us during the entire deck building process and did a perfect job. The attention to detail to ensure a high quality finish and making the right recommendations for materials and lights – went a long way to ensure we came out extremely satisfied with their work and to post this endorsement and recommending them to our friends. area. Rest assured that if you bring them aboard you will be happy and have a deck that may just last a lifetime. I can’t say enough about this company. They are worth the wait! Interested in a new patio design? Does your deck need repair or restoration? Welcome to Decks By Ziec, the deck and patio specialists. Custom built and made with the care and workmanship only 17 years of training can provide, Peter Ziec is both an expert craftsman and savvy professional contractor, garnering the respect of his clients and peers alike. Don’t trust your deck design, refinishing or deck building to a less experienced or responsible contractor. Add value to your home while making your outdoor space a pleasant environment for all. Safe, beautifully constructed and durable in all types of weather, a deck constructed by the Decks by Ziec team is an enduring investment in your property, something to be admired and appreciated for years to come. As Peter Ziec says often, “little things make all the difference,” and it’s true. As a businessman who values straightforward communication and follow through, he’s earned his reputation as the deck contractor you can count on with every project he completes. Discover the Decks By Ziec difference. Whether you need a reliable NJ paving contractor, a gorgeous new deck design, or simply repairs to an existing deck, get the best. Call Peter Ziec and his team today. Please take your time to scroll through our image gallery and read what our customers say about us. Peter Ziec's philosophy is simple: it only takes a little longer to do it right. Many years of training and exposure to European craftsmanship are evident in every fine deck he builds. It’s the details that make or break the appearance and longevity of an exterior deck. All designs and layouts are possible, and of course - always keeping within your project’s overall budget. Peter Ziec takes pride in each and every deck project. Click here see what it’s like to work with a builder who knows his job and still cares about doing it right. How many people have called contractors and never received a call back? How many contractors are too busy to take the time to come out and give an estimate and then tell you all the things that they "can't do" instead of what they can do. Having found Decks by Ziec by chance on the internet, we want to tell anyone that is looking for a great deck to look no further than Peter and his brother Andrew of Decks by Ziec. Peter's "can do" attitude and his enthusiasm with his creations is a pleasure to experience. We started out with an "idea" of what we wanted to do, and Peter treated our project like it was his own house or his own child that needed to be molded. His vision was extraordinary and if you choose Peter to build your deck, i recommend you trust his insights and creativity in his work. From the first time that we met with him, his follow through on returning an "estimate inquiry" , to his visit to our home on a Sunday, to fulfilling his start time commitment and end time completion, we have never hired a more dedicated and committed individual. In the American society today where there are laments about lack of follow through, work ethic and truthfulness in dealing with contractors and tradesman, it was so refreshing to deal with Peter and his brother. They exemplified to us what it must have been like years ago with tradesman who came to the United States and built this great country with their hard labor work ethic. Peter and his brother exhibit all of the things that many people in our society lack today. His word is as good as gold and his work ethic and talent in his creations is superb. I would recommend Peter and his brother Andrew of Deck's by Ziec to anyone looking for a beautiful addition to their homes. Trust their vision and building expertise. You will not be disappointed. Jim and Lindsay Oettinger Closter NJ. Mariann and David Owens January 2014 Fair Lawn NJ. I would like to tell of the fantastic job Peter Ziec did on giving me the most creative, attractive and breathtaking deck on our home. We were recommended to Ziec by my niece, Kimberly Kostick, who had a lovely three season room on her home which is also very well designed that I knew I wanted Ziec to do my deck. He arranged a curved deck where I can easily accommodate 25 or more guest to sit around the Jacuzzi. The lighting is beautiful and his imagination is so exquisite that he manicured such original designs. He said he would be finished in three weeks and he certainly was. He came whether it was 30 degrees or warmer. He came early and he did keep his schedule of finishing within three weeks. His personality is so pleasant it was so nice to see him and his brother each morning. What a delight in a contractor. He is well worth every penny I spent, I would recommend him to anyone, his work is classic.